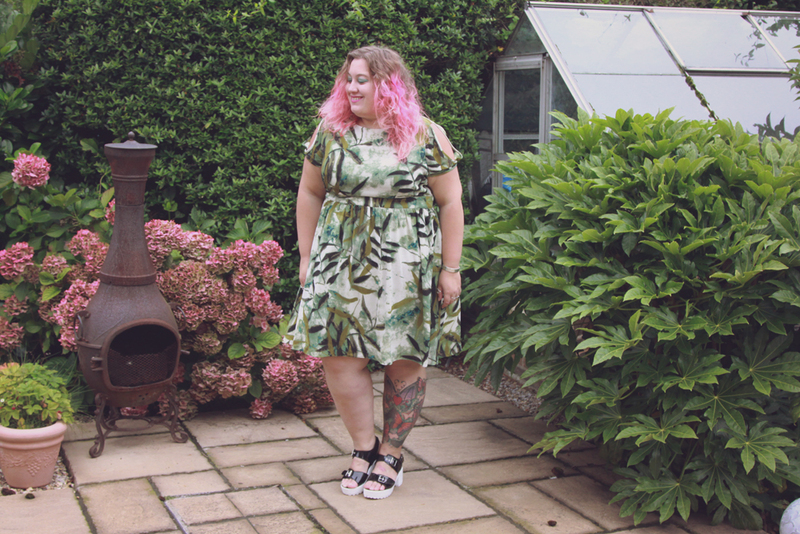 When I went to the Curve Fashion Festival I couldn't resist trying on a bunch of LovedRobe's different new autumn/winter pieces. I'm a big fan of LovedRobe, they consistently produce beautiful designs, whether for themselves, or for ASOS or Simply Be. They are always high quality, and they've always been so supportive of me and my blog. I adore them! I decided to try on different colours to what I would usually opt for and fell in love with this dress, which is so outside of my usual colour comfort zone. This cold shoulder dip hem dress* is green is just so gorgeous! The dress has a great texture to it, it's fully lined too so lies just right. It has a waist section that sits just below my busy, and the length is just above my knee. I'm 5ft 11 so on most people this would be below the knee. It has a slight dip hem which I like in dresses as it ensures the length stays more even over a bigger bum. The colour and pattern is my favourite thing about this and what really attracted me to it. Green is a colour I love but don't wear enough of, and this dress is my first step to changing that! I usually opt for a darker base but the creamy colour really makes the different shades of green pop. The dress also has cold shoulders. 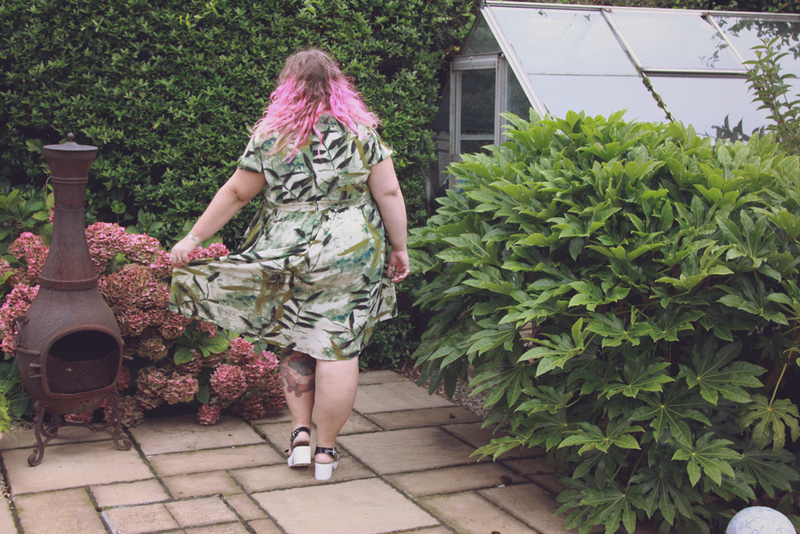 Now I know, some people consider them to be the ultimate plus size fashion cliche, but I enjoy them! I hate being too warm and that little split can really help regulate your temperature. I know they can be over used, but in this dress they look so cute and add a bit of extra detailing. 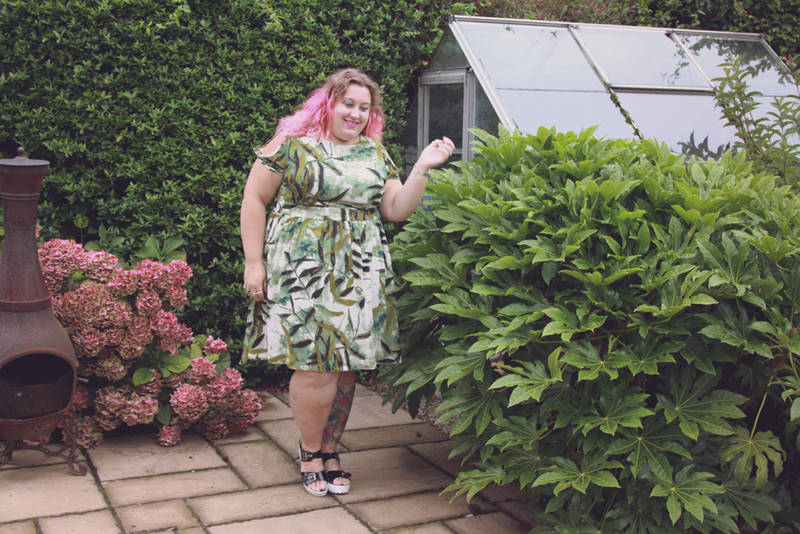 You can also get this dress in a rusty colour combination of reds, oranges, blues and greys that is so autumn! 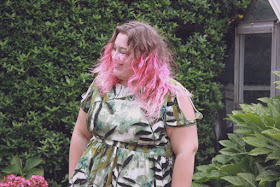 You can see Lucy Earnshaw rock the other colour over on her blog here. I think it's a really versatile piece, I went for a girly look with heels, but put on a pleather jacket and stompy boots and you could rock this up too. Wearing more different colours is part of my new mission for myself, and I've officially fallen in love with green! *this item was a gift. In no way does this impact upon my opinions which are entirely my own. Thanks to my Pops for the blog photos! Love the greens on you hon. You should Deffo invest in more! Also love this fabric. At the moment though I feel like everything had a cold shoulder. 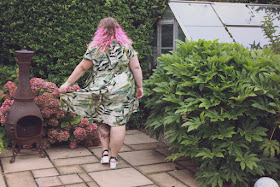 I used to quite like them but they seem to be a go to design staple for plus size now and I think I have cold shoulder fatigue. Lol. Floral in autumn is so much more fun that in Spring for some reason, thanks!